My husband and I were married in 2013. When we got married, we’d both worked in the wedding industry for quite awhile. 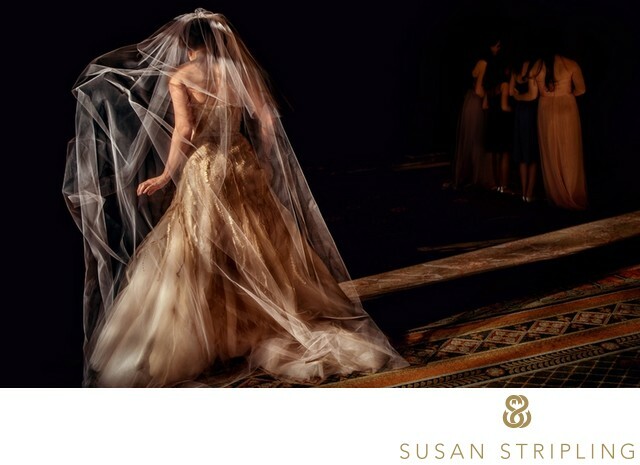 I am married to another wedding photographer (who owns his own business - we don’t work together at Susan Stripling Photography! ), and all I could think was how hard can wedding planning be, anyhow? We both knew weddings. We’d seen hundreds of weddings each, knew how to craft a timeline, and saw where people made great and poor decisions when it came to the flow of the day. We’d seen weddings where we thought I’d love to incorporate that into our day as well as weddings where I thought I am NEVER doing that at our wedding. We got engaged in the fall of 2011, and decided to wait until the spring of 2013 to get married. As professionals in the wedding industry, most of our dearest friends are also wedding photographers. We knew that having our wedding on a prime date in prime wedding season would mean that many of our nearest and dearest wouldn’t be able to travel to come celebrate with us. So we decided to wait to get married in April of 2013, giving us nearly eighteen months to plan our wedding. Despite thinking that I knew it all when it comes to the world of weddings, many things about the process surprised me. I learned a lot about wedding planning. Now that my own wedding is a few years past, I can look back on my decisions and see which were great ones and which should have been decided differently. I hope that my experiences planning my own wedding will help you plan yours! Do This: Pick whatever date you want, giving thought to what might work best for everyone. Not That: Ask everyone in your entire life what date works best for them and let them dictate when you get married. We got married on a Wednesday. That’s right, a Wednesday. Smack in the middle of the work week. Why did we do that? Well, when most of your friends are fellow wedding professionals, you know precisely what a huge thing it would be to ask all of them to take a Saturday off. Not only that, most of them are out-of-town friends, so we’d be asking them to take a whole weekend off. We understood what a huge thing that was, so we did not do that thing! I had one request when we chose a date : I did not want to be hot. I loathe summer months, and despise sweating through formalwear! I wanted to pick a month that was outside of the “oh no, it is going to snow and no one is going to be able to travel to the wedding” months, but before the “my face will melt right off if we go outside” months. We narrowed it down to November and April. Since November is still wedding season, and April isn’t traditionally a super busy month for us, we chose April. Be smart about the date you pick. Don’t ignore huge life events that might be happening for important family members just to get your favored date, but don’t let the schedules of everyone else around you dictate what you do. Be kind, but also be true to yourselves You have to love the month and day you have chosen to be married! Do This: Pick whatever you want! Not That: Poll all of your friends, family, and Facebook as to what venue is best. I cannot stress this enough : get married where you want to get married. As wedding photographers ourselves, my husband and I already knew lots of venues. After we settled the “Do we get married in New York or Philadelphia?” debate, we started looking at all the Philly venues that either of us had ever worked at before. We looked everywhere from large ballrooms to intimate restaurants before finding the glorious Front and Palmer. We knew from the moment we walked in that this was where we wanted to be married. It was a warm, welcoming, quirky, fun space and I loved everyone that we met who worked there. We felt very taken care of, and at the end of the day, we just loved the space. Polling all of your family, friends, Facebook friends list, and everyone you’ve ever met might sound like a great way to get opinions. After all, wouldn’t your nearest and dearest know what you like best? As I’m sure you’ll find, everyone loves to have an opinion when someone is getting married. And those opinions can overlap, with the background noise getting louder by the day. Ask a few friends, sure. But make sure that you are choosing together. Put all the noise aside and pick the venue you like best. After all, you’re the ones getting married there! Do This: Wear whatever you want. Not That: Listen to what everyone else thinks. Sometimes, for fun, I watch Say Yes To The Dress. (Which I was actually asked to be on when I was engaged. I said no to that. My friends are far too snarky and sarcastic and I’m fairly sure we would have come off as total lunatics.) I used to love it, but now it bothers me. I feel terrible for the poor woman trying on gowns only to be scrutinized and criticized by people who are supposed to be on her side. Wear whatever you want on your wedding day! Who cares! I took very, very few people with me to look at dresses. My two best girlfriends came, and that was it. When it was time to really choose, to put down money at that Monique Lhuillier trunk show, my mom flew up from Georgia and my girlfriends came with me again. My kids came to my fitting, and so did my stepdaughters. That was it. My friends liked a few different dresses, and so did I. When I found the dress I really liked, I didn’t care what anyone thought. They loved it, but I’d have bought it regardless. I had important questions, such as Does this make me look okay from the back? and Is going with a non-white gown super crazy? It was helpful to have answers, but I was so besotted with my dress that it didn’t really much matter. I felt beautiful in what I wore, and I really love that dress. I still love it. It’s in my studio, on a dress form, so that I can look at it every day. It is, to this day, one of my favorite things to have ever worn. Do This: Have a trial before the wedding day. Not That: Have multiple trials and insist on makeup that won’t look right on you. When I hired the professionals to do my hair and makeup on my wedding day, I had trials with both of them. I came in with inspiration pictures, but I knew they were just that : inspiration. I brought a few huge bun ideas to my hair stylist, and a few images of brides with simple makeup but dramatic eyes to my makeup artist. We talked about why I liked each of these looks, and then they created specific looks for me based on the inspiration images and discussion that followed. I have seen clients like a particular makeup look and insist that their makeup artist follow it, despite it not looking good on their face/bone structure/skin tone. I’ve seen beautiful women insist on Kardashian-like contouring, even after the makeup artist advised against it. My only true specification was NO TENDRILS TO BE HANGING DOWN NEAR MY FACE. I’ve seen so many weddings where the bride has large hunks of “wispy tendrils” hanging by her face, obscuring it in all profile shots. I didn’t want that. Beyond that, I wanted a sense of believable drama. The end. I trusted the professionals that I hired, and let them do their job. Once we did the trials, I had a few tweaks for each, but I didn’t schedule trial after trial to try different looks after different looks. Do This: Do your research and go with your gut. Not That: Choose solely based on price. While price is absolutely important, emailing hundreds of vendors and choosing who to hire only based on price isn’t the best decision. While you’ll certainly save money, the collaborators that you’ll work with on your wedding are a personal decision. You have to be smart about your budget and hire professionals that can help you execute a vision - or help you create a vision if you don’t have one! The event designer we worked with on our wedding would never have won if we’d made decisions solely on price. However, the time he saved us was incredible. I was able to vaguely sketch out how I wanted our wedding to feel, and he ran with it to perfection. I didn’t have to spend hours poring over Pinterest and going back and forth with him to lay out what we wanted. In the long run, the time he saved us was well worth the higher price tag. Do This : Find a place to get ready with great light where you feel comfortable and at home. Not That: Just defer to the venue and get ready in the “getting ready room” or anywhere you don’t feel comfortable. After shooting so many weddings, I have seen a lot of getting ready processes. They have ranged everywhere from watching clients get ready in the home they grew up in to watching clients get ready in a tiny corner of a cramped, dark venue “bridal suite” or “groom’s suite.” The getting ready process is so personal, why get ready in a place that doesn’t feel good to you? I chose to get married at a hotel in Philadelphia that ticked all of the right boxes. It was comfortable, and the rooms felt like residences, not just random hotel rooms. I wanted my memories of being in that space to be good ones, and I wanted to feel at home. I chose a hotel with good food, cozy beds, and beautiful light that streamed into the bedrooms. I went an extra step and found a good corner room where the light streamed in just so. The important part was that I was comfortable, and I felt at home. I also made sure to check into the hotel well in advance of the day of the wedding. We were married on a Wednesday, and I checked in on Monday. I wanted some time to settle in, not just rushing into the room for the first time on the morning of the wedding. This was a great decision. I spent the night before the wedding watching movies with my daughters in our huge, comfy bed before snuggling up with them and falling asleep. That is a memory that I will have forever, and I credit the making of it largely with how comfortable we felt in the space. Do This: Whatever. You. Want. My husband is Jewish. I am not. When it came time to plan our ceremony, I knew we weren’t getting married in a church or a synagogue. We were married by one of our dear friends, and a rabbi was present for the more religious aspects of the ceremony. We were getting married in a non-religious venue, so we really could craft our ceremony however we wanted. I wanted to say traditional wedding vows. My husband wanted parts of a Jewish wedding ceremony interwoven into ours. I didn’t want the rabbi to do the standard “When I talked to Susan about Cliff, she says that he is her best friend!” speech. We wanted to say our own vows on top of the standard wedding vows. Other than that, we wanted a minimum of fuss and a ceremony that was really just about bringing us and our children together to make a family. The end. While it’s absolutely important to have your religious traditions and family traditions honored, ceremonies nowadays can truly be whatever you craft them to be. I know that the wedding rings that we wear were touched by every single person at our ceremony, and that’s a lovely memory that is important to me. Find traditions that you love, and make them a part of your ceremony. It will mean more to you if you do! We decided to not have a bridal party, choosing to have only our children stand up with us. My husband was walked down the aisle by his daughters, and I by mine. That was one of my favorite memories of the day, and it was so very meaningful to us. We stood under the chuppah with our children, and it was all I could have ever wanted. Do This: Prioritize what is most important to you, and plan for that. Not That: Do a first look just because you think you have to. Take a thousand family pictures. My husband and I were dead set on not doing a “first look.” I did not want to see him until I came down the aisle, and he felt the same. We knew that what we were doing would affect our photography coverage. I knew that the ceremony wasn’t until after sundown, meaning that any pictures we took afterwards would be basically in the dark. I knew that we would have to pack everything into cocktail hour, and I wanted to also take my hair down at that time. We knew what making that decision would do to the time we had to take portraits, and we did it anyhow - because that was what was important to us. I knew that if we wanted an hour of pictures of the two of us together, that we’d have to do a “first look”, but neither of us wanted either of those things. I also knew that if we wanted a lot of family posed images that we’d need more time, but we didn’t want those things either. I think we have a total of two portraits of us on our wedding day. We took two family formal images : us with our kids, and us with family. The end. When it came right down to it, the moments of the day were more important to us than spending a lot of time taking portraits. I don’t regret that in the least bit. I treasure the moments that we share in the photographs more than the posed portraits. That is just what we decided to do. Many couples decide differently, and that is up to them. The important thing is to weigh the pros and cons of whatever your options are, then choose the ones that work the best for you. We knew that we wouldn’t have many portraits, and we were okay with it. The decisions that we made ended up making us happy, and that was the most important part. Sense a theme to most of what I have learned? Do whatever you want. While I know it’s difficult to not want to please everyone around you, remember that the day is for you and your future spouse. Your mom might love a white-on-white theme, but if a Game of Thrones wedding is what you want - well, who is getting married here? I went into our wedding with just one inspiration picture. It was of a ribbon-draped chuppah, and I loved it. I took that to our event designer and said “Hey, I like this ribbon-draped chuppah, what do you think? And can we kind of make it look like dinner in a Harry Potter movie with lots of fire and also, we don’t really love flowers.” We went to visit his design studio, and everything fell into place - those chairs with that table. We were there for less than an hour, and then we were done. Trusting our event designer was everything. He was able to take my vague mumblings about family style dinner and fire and lead us down the right path. I am particularly proud of choosing the long wooden farm tables and clear ghost chairs. 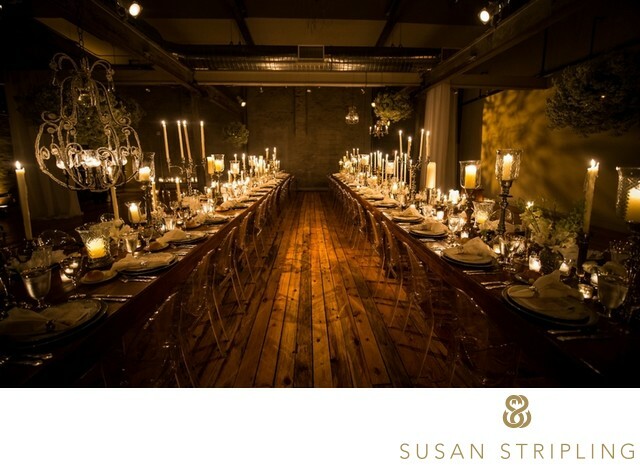 I loved pairing the rustic tables, which were so in line with the old-factory feel of the venue, with the modern sleekness of the lucite chairs. I loved that my husband didn’t say “Clear chairs with wooden tables?” I loved that our event designer loved the idea. It was a great marrying of minds, and I could not be more thrilled with how everything turned out. I’d make the same decisions if we were getting married again today! Not That: Choose from the same standard menu options without tasting them first! We chose to serve our seventy guests family style. There were incredible places of passed risotto, barolo braised short ribs of beef, striped bass, and butternut squash ravioli. There were a variety of sides, small passed plates, and more. I was so touched by the incredible customer service at our venue when my youngest daughter didn’t like any of the options - they made her simple butter noodles, and she was happy as can be. I’ve been to so many weddings and eaten so much wedding food over the last seventeen years of my life! I’ve had every variety of “chicken in sauce” that exists, and I didn’t want to eat that on my own wedding day. My husband and I consulted with our caterers about the menu options, and trusted their opinions. We talked about family style versus individual plates, and we loved the idea of passing around food in a more communal manner. As a result, our wedding dinner felt more like sharing a meal with our family and closest friends and less like “eating at a wedding.” It was a great experience, and I am grateful to our caterers for helping make it feel more comfortable and less fussy! Do This: Think about who you want to speak for and about you. Buck tradition if you want to! I’ve seen speeches of all kinds, types, lengths, and emotional content. I’ve seen rehearsal dinners where all the speeches happened there. I’ve seen weddings where toasts and speeches lasted two hours without a break. When we faced creating the timeline for our reception, what did we want? We knew that we didn’t want to stop dinner to … well, to talk. We didn’t want to break up dinner with dancing breaks, we had a pretty strong sense of wanting to enter, eat, then dance. We didn’t want to chop up each part of the process. We also felt somewhat awkward about sitting there while friends gave speeches that we asked them to give. Because of these feelings, we chose not to have toasts during the reception at all. We had a small part of our ceremony where anyone who wanted to get up and speak could. We had a handful of family and friends get up and offer up heartfelt thoughts, truly on the spur of the moment. We were spared speeches that had been written beforehand, and no one had to speak who didn’t want to. It was a really meaningful part of our ceremony, and I am so glad that we chose to do the “speech and toast” part of our wedding in that manner. Do This: Think about how you want to experience this part of your night. Make the decision that feels the most fun to you two! Not That: Party longer than you want or shorter than you want, include traditions you don’t like, or many any decision that results in the type of party you wouldn’t want to go to! Neither my husband nor I are big party-goers. I never liked dancing at clubs, going to parties, or getting loud and crazy in big groups of people. We knew that if we tried to throw a “party” that was not how we’d normally hang out with our friends that the results would be a bit awkward. We also knew that our kids would be at the wedding, and our kids would love to dance. I wanted to dance with my daughters, and I wanted our friends and family to have a good time. We sat down with the timeline and took a look…if dinner took ninety minutes to two hours, and we didn’t dance in between courses (which neither of us liked the idea of), then we’d have about two hours of open-floor dancing when dinner was over. That was perfect for us! We hired our favorite wedding band, and crossed off most of the playlist. We didn’t want to hear Earth, Wind, and Fire…we’ve heard that at so many weddings! I love the songs my clients dance to at their own weddings, but I wanted something a bit more us at ours. We talked about this to our bandleader, and came up with a super-fun two-hour list of songs guaranteed to make everyone smile, dance, and have a good time. We didn’t break up the dancing with any formalities. Once the dance floor opened, it stayed open. We started with out first dance, I danced with my dad, and then it was all party all the time….well, for the next two hours, at least! Do This: Do you want to party? Hang out? Or just go to sleep? Not That: Keep the party going if you feel like you’ll have had enough! As I mentioned before, my husband and I are not huge party people. When our wedding was over, our kids went off to bed, and most of our guests went home. It had been an amazing day, but neither of us wanted to go to a bar or close down some club when our wedding was over. We wanted to sit down, talk to people we loved, and just be after a crazy day of activity and emotion. We had a suite at our hotel, which had two bedrooms and a huge living room area. We ended up inviting about fifteen friends out of our seventy person guest list to come back to our suite and hang out. We ordered wine and champagne and snacks fro room serve and sat around that room until nearly four am. It was wonderful. It allowed us to keep the evening going without more “party”. It was quiet, we could talk, and it was a great way to wind down after a long day. I loved our quiet “after party” and cannot imagine us doing it any other way! Do This: Enjoy the process. Make decisions that make you happy. Realize what a joy it is to marry the person you love. Not That: Listen to the internet, too many opinions, or anything other than your own hearts. It seems like the second you say “We’re engaged!” everyone you’ve ever known has opinions about how you should wear your hair, decorate your reception, choose your date, and so forth. While I loved talking to my friends about our wedding, at the end of the day, I wasn’t marrying my friends. I wanted the choices made to be by my husband and myself, and by extension, our children. Those opinions were the ones that mattered the most to me. While we were conscious about the needs and wants of others when planning our wedding day, we were most conscious of how this day was bringing us six together as a family. That was what was most important to us, and we never lost focus of that. Having a sleepover with my daughters the night before the wedding. Keeping our getting-ready room to family only. I got ready with my daughters, my stepdaughter, my mom, and that was it. Two friends stopped by for a bit, but the headed out when the room got too crowded. My dress. Oh, how I love my dress. I love it still, and would choose it again in a heartbeat. Having only our children stand under the chuppah with us. It was so beautiful, and so meaningful. Having zero fuss during our day. We didn’t include a cake cutting, no toasts during the reception, no fussy favors, nothing that made me irritated. If I even remotely thought “I do not like that thing” we did not do whatever that thing was. Having brunch the morning after the wedding with my parents and family. Not taking hours to have portraits taken on the wedding day. I have zero regrets about that. I knew in my heart that we were not huge portrait people, and that the moment-based images of us together would have be more important to me long-term than a bunch of posed portraits. And I was right! I made my own brooch bouquet out of pins, brooches, and small charms that I collected for quite a long time. It took hours, days, and yes, even months. I even made small bouquets for our children, and we all still have those bouquets in our homes to this day. We had an officiant who was an rabbi for the legal elements, but we were married by one of my oldest friends. This was important because our friend spoke to us, with us, and to the people that were most important to us in a way that a paid officiant could never have done. We didn’t bother with the portraits of the two of us on our wedding day. We did some portraits the day after, which made things less stressful. I liked going to cocktail hour to be able to mingle with everyone during that hour. I loved the family style meal because it was a small, intimate gathering. I liked the intimacy of our guest list. We invited everyone because we wanted them there, not because we had to have them there. Each and every single person there meant quite a bit to us, rather than peripheral acquaintances that were more ceremonial in nature to have them there rather than the importance in our lives. 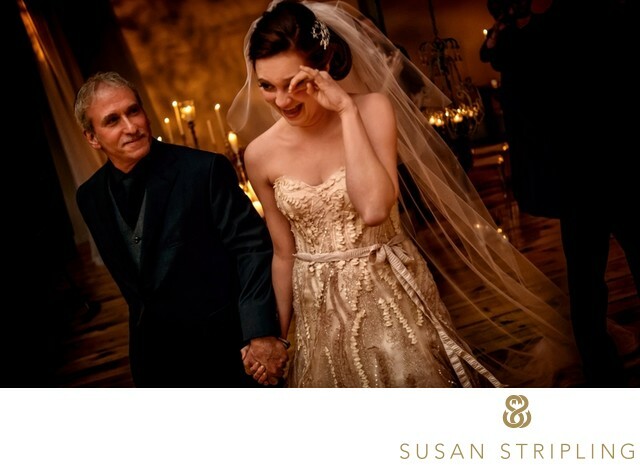 It was important to me that I walked down the aisle with my daughters on either side of me, and that Susan was walked down the aisle by our daughters. That was a touch that I loved. While it was a Jewish ceremony from a religious standpoint, we also took meaning from the Quaker ceremony and had a few chosen people speak during the ceremony. I loved the emphasis of lighting over floral design. 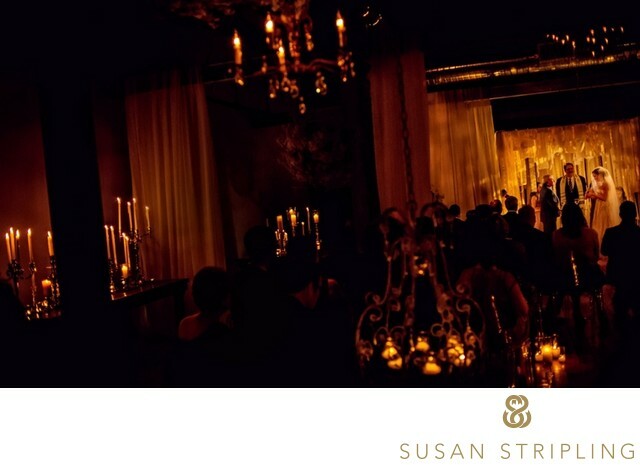 It created an ambiance that was warm, simple, and stunning with a huge wow factor. Neither Susan and I are huge fans of flowers, and a huge floral budget would have been wasted money for us. **Video courtesy of Ray Roman. Photography by Susan Stripling, Cliff Mautner, Daniel Kudish, Matt Mendelsohn, Jeffrey Mosier, Marcus Bell, and Ben Chrisman. We love you so much. Thank you.